This book will show you exactly how to win back your partner and re-ignite the passion in your once-happy marriage life. Happiness in your marital life depends far more on what you do than on what your spouse or anyone else does. No matter the current state of your marriage, you can improve it. This book will show you exactly how to win back your partner and re-ignite the passion in your once-happy marriage life. Happiness in your marital life depends far more on what you do than on what your spouse or anyone else does. No matter the current state of your marriage, you can improve it. Take responsibility, and make your marriage better. Successful people in marriage accept responsibility for their mistakes and learn from their experiences. They take action to effect changes in their lives and triumph over their difficulties. And successful people don't give up and quit. Anyone can quit. But that is the easy way out. Remember Jesus said you could move any mountain! You Can Have A Happy Marriage Relationship! Life isn't all sunshine. But a happy marriage relationship is the will of God for you, and you deserve it. This book will show you exactly how to win back your partner and re-ignite the passion in your once-happy marriage life. Remember the feelings you shared when you first fell in love? When it was impossible to look at each other without smiling? Just spending time alone together was the perfect night. Click to download this book and learn how you can make it work. Why have so few been able to find even a measure of the enjoyment they originally believed marriage would bring? Why have so many others decided to simply live together, avoiding commitment? Why do so many openly admit that they do not trust their spouse? Why do over 75% of marriages experience adultery? Why such rampant confusion about marriage and its purpose? What has brought the once sacred institution of marriage to such a deplorable state of affairs? Most married couples lack true happiness, they have no idea how to build it. God instituted the marriage covenant, and the principles governing its success. Without them, real happiness is impossible. With them, you can experience a boundless joy. How many truly happy married couples do you know? Is your marriage happy? Are you enjoying the life you anticipated? My dearly beloved, why not take advantage of this oppotunity and buy this E-Book. Think about the best thing that could happen - a happy, healthy marriage that could last the rest of your life. If you truly want happiness in your marriage, then I want you to remember this day. Because today determines the fate of your marriage relationship. Take action today and you can change what tomorrow brings. Do nothing today and tomorrow will look no different. You have nothing to lose, you stand to gain a happy, healthy marriage life filled with excitement and laughter. 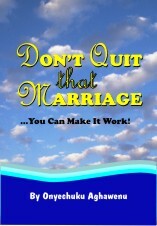 So download Don't Quit That Marriage ...You Can Make It Work! Right now take the first step towards a warm, lasting happy marriage relationship.